We are starting 2018 with a burst of color! 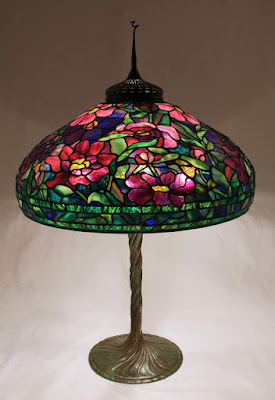 This week we completed the first lamp of the new year, a 22″ Peony shade that we began during the holiday season. Blending together a delicious mix of glass in saturated colors and textures, this shade is a veritable feast for the eyes. The 22″ Peony shade has a bold design aesthetic that calls for skillful glass selection. Towards the top of this shade the flowers blend from a lightly textured fuchsia into striated reds and lush purples. 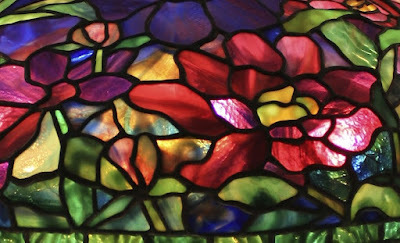 The flower colors are supported by a shifting background that includes mottled, streaky, and fracture glass in mixed tones of deep blue and green highlighted with amber, purple, red, and fuchsia. The intensely rippled deep green border rows towards the bottom of the shade underscore the colors and various textures found throughout the shade. When experiencing a lamp in person, it is exciting to experience how your eye blends colors together at a distance that are distinctly individual when viewed close up. This is the same visual experience one has when viewing an Impressionist painting. Over the years at Tiffany Studios, the 22″ Peony pattern was subtly changed several times. This popular shade has three distinct variations, plus a forth “elaborate” version. At Century Studios, we offer both versions with the double lower borders (there is a third version with three borders) and the 22″ Elaborate Peony shade. This lamp was commissioned by a client in the Chicago area and is shown on the Twisted Vine base.